More information about this tool at arXiv:1505.06736. 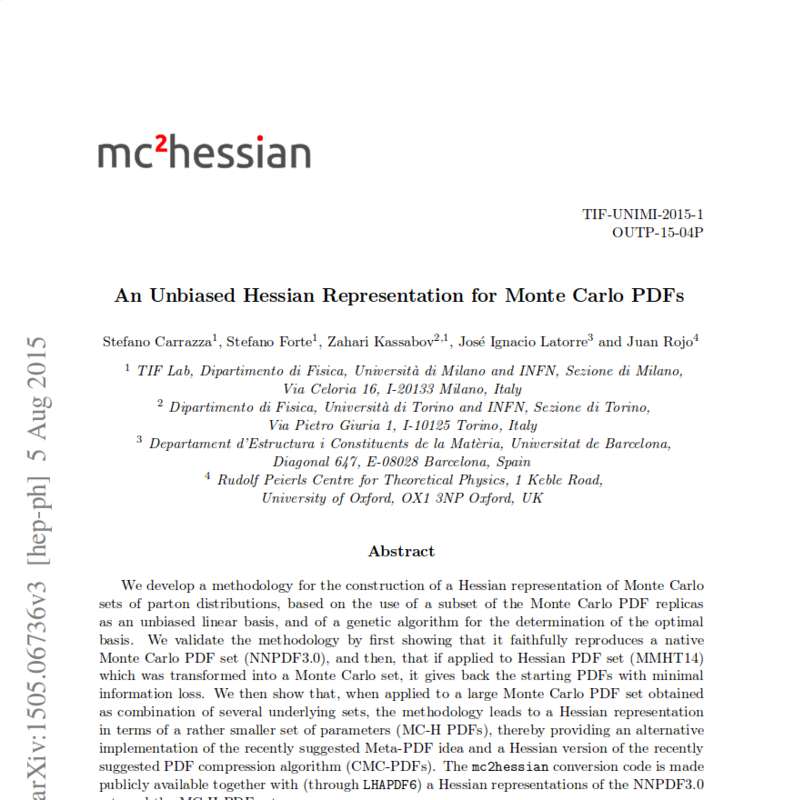 More information about this tool at arXiv:1602.00005.
gg->h, Higgs pT distribution, LHC @ 13 TeV. 10 bins [0,200] GeV. gg->h, Higgs rapidity distribution, LHC @ 13 TeV. 10 bins [-2.5,2.5]. httbar, inclusive cross-section, LHC @ 13 TeV. httbar, Higgs pT distribution, LHC @ 13 TeV. 10 bins [0,200] GeV. httbar, Higgs rapidity distribution, LHC @ 13 TeV. 10 bins [-2.5,2.5]. hW, Higgs pT distribution LHC @ 13 TeV. 10 bins [0,200] GeV. hW, Higgs rapidity distribution LHC @ 13 TeV. 10 bins [-2.5,2.5]. hZ, Higgs pT distribution LHC @ 13 TeV. 10 bins [0,200] GeV. hZ, Higgs rapidity distribution LHC @ 13 TeV. 10 bins [-2.5,2.5]. ttbar, inclusive cross-section, LHC @ 13 TeV. ttbar, tbar pT distribution, LHC @ 13 TeV. 10 bins, [40,400] GeV. ttbar, tbar rapidity distribution, LHC @ 13 TeV. 10 bins, [-2.5,2.5]. ttbar, top pT distribution, LHC @ 13 TeV. 10 bins, [40,400] GeV. ttbar, invariant mass distribution, LHC @ 13 TeV. 10 bins, [300,1000] GeV. ttbar, pT distribution, LHC @ 13 TeV. 10 bins, [20,200] GeV. ttbar, rapidity distribution, LHC @ 13 TeV. 12 bins, [-3,3] GeV. VBF hjj, inclusive cross-section LHC @ 13 TeV. VBF hjj, pT distribution LHC @ 13 TeV. 5 bins, [0,200] GeV. VBF hjj, rapidity distribution LHC @ 13 TeV. 5 bins, [-2.5,2.5]. W, inclusive cross-section LHC @ 13 TeV. W, cos(phi) distribution LHC @ 13 TeV. 10 bins, [-1,1]. Cuts: pT(l) > 10 GeV, |eta(l)| < 2.5. W, missing Et distribution LHC @ 13 TeV. 10 bins, [0,200] GeV. Cuts: pT(l) > 10 GeV, |eta(l)| < 2.5. W, lepton pT distribution LHC @ 13 TeV. 10 bins, [0,200] GeV. Cuts: pT(l) > 10 GeV, |eta(l)| < 2.5. W, lepton rapidity distribution LHC @ 13 TeV. 10 bins, [-2.5,2.5]. Cuts: pT(l) > 10 GeV, |eta(l)| < 2.5. W, mT distribution LHC @ 13 TeV. 10 bins, [0,200] GeV. Cuts: pT(l) > 10 GeV, |eta(l)| < 2.5. W pT distribution LHC @ 13 TeV. 10 bins, [0,200] GeV. Cuts: pT(l) > 10 GeV, |eta(l)| < 2.5. W rapidity distribution LHC @ 13 TeV. 10 bins, [-4,4] GeV. Cuts: pT(l) > 10 GeV, |eta(l)| < 2.5. Z, inclusive cross-section LHC @ 13 TeV. Z, l- pT distribution LHC @ 13 TeV. 10 bins, [0,200] GeV. Cuts: pT(l) > 10 GeV, |eta(l)| < 2.5. Z, l- rapidity distribution LHC @ 13 TeV. 10 bins, [-2.5,2.5] GeV. Cuts: pT(l) > 10 GeV, |eta(l)| < 2.5. Z, invariant mass distribution LHC @ 13 TeV. 10 bins, [50,130] GeV. Cuts: pT(l) > 10 GeV, |eta(l)| < 2.5. Z, lplm pT distribution LHC @ 13 TeV. 10 bins, [0,200] GeV. Cuts: pT(l) > 10 GeV, |eta(l)| < 2.5. Z, l+ pT distribution LHC @ 13 TeV. 10 bins, [0,200] GeV. Cuts: pT(l) > 10 GeV, |eta(l)| < 2.5. Z, l+ rapidity distribution LHC @ 13 TeV. 10 bins, [-2.5,2.5] GeV. Cuts: pT(l) > 10 GeV, |eta(l)| < 2.5. Z pT distribution LHC @ 13 TeV. 10 bins, [0,200] GeV. Cuts: pT(l) > 10 GeV, |eta(l)| < 2.5. Z rapidity distribution LHC @ 13 TeV. 5 bins, [-4,4] GeV. Cuts: pT(l) > 10 GeV, |eta(l)| < 2.5. 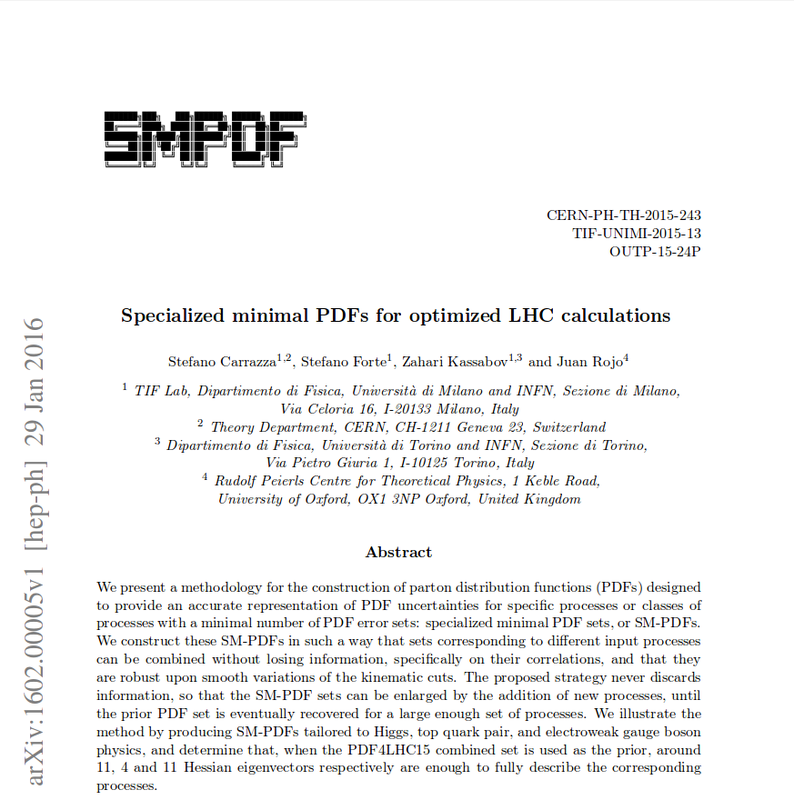 If you use results generated by this website please cite the SMPDF and mc2hessian papers.